Cobb (Leonardo DiCaprio), the best dream extractor in the market, is put under test, unbeknownst to him, by Saito (Ken Watanabe), a powerful businessman, to recover secret documents that only he knows the location of. Cobb passes the test, but not on time to save himself from Cobol, a corporation that has put a price on his head. The real job for which Saito wants Cobb is to plant the idea of dissolving his company in the mind of business rival Robert Fischer Jr. 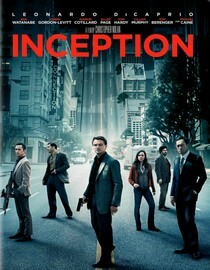 Since it is easy to track the genesis of an idea, only few people have ever attempted inception, Cobb being one of them. Cobb accepts the job, with the promise that Mr. Saito is going to help him return to the U.S. from where he has been fleeing ever since Mal (Marion Cotillard), his wife, committed suicide and left a letter blaming him for it. Since Mal has taken complete control of his dreams, Cobb, once a brilliant architect, has no choice than to recruit another architect for the mission. The help comes from Ariadne (Ellen Page), a bright student of architecture. For the inception job they also need a chemist to formulate the drugs that are going to be used to induce sleep, a security guy (Arthur, interpreted by Joseph Gordon-Levitt) and a forger (to adopt the mannerisms and personalities of the people close to Fischer). The plan is to go three levels down in Fischer’s mind, which means that they are going to be in a dream inside a dream, inside another dream. The first stage can last one week, the second can last six months and the third stage may last ten years, and that is if everything goes according to plan. Does it ever?! The group embarks on the mission, but soon runs into trouble for Fischer has trained his mind against foreign invaders. Will they accomplish their task, unscathed? I guess you have to see the movie to find out! I heard so much about this movie during the summer that I could hardly wait until it came out on DVD. However, after watching it last night I felt nothing; not excitement, not intellectual stimulation, which I guess was the goal of the script writers, I simply felt tired and confused. I was as confused as if I had just left a quantum mechanics lecture in college. What were they thinking? That making the plot confusing enough would make it seem smarter? I was simply disappointed! Despite its flaws, the good acting and special effects somehow make this film watchable.